What do you have to get off your chest before the end of the year? Comment away! We hope you have a happy end of 2009 and on to a better 2010 (we weren't too fond of this year!) Updates as warranted today -- we're planning on ushering in the new year in our jammies, watching the ball drop on Time Square, with a martini and the police scanner telling us what the folks in Pasadena have gotten themselves into. We've never liked that "Auld Lang Syne" seemed to be the only New Year's song (and what does that MEAN, anyway?) Local troubador Bill Burnett wrote a new song that captures its melancholy nature. Do regularly check out Burnett's Song Mine for more goodies like this one! Hurry in now, select holiday decor, stationery and gift items now on closeout! Help us make room for our New Year arrivals and save 50% or more! Drop by on 12/31, for some special goodies and giveaways! We'll be open until 3 PM and would love to see you! Santa knows where to find the best bargains after the big day is over.....looks like he's stocking up for next year! "Tickets may be purchased through Altadena NAACP"
The NAACP Image Awards is the nation's premier event celebrating the outstanding achievements and performances of people of color in the arts (motion picture, television, recording, and literature), as well as those individuals or groups who promote social justice through their creative endeavors. The 41st NAACP Image Awards will be held on Friday, February 26, 2010 at the Shrine Auditorium, 665 West Jefferson Blvd., Los Angeles, California. Doors open at 3:00 p.m., Pre-Show Taping 3:30 p.m. and doors close at 4:45 p.m.
Tickets for the 41st NAACP Image Awards are available now for purchase through our Altadena NAACP branch. The deadline to purchase tickets is January 16, 2010. Ticket prices will range from $50 to $500. For ticket sale information, contact Judy Matthews, Publicity Chair, at judy.matthews@altadenanaacp.org or call (626) 794-7999. 2258 Midlothian Dr, Altadena, CA 91001, (626) 797-5622 0r (626) 422-9442. UPDATE 1/1: Jack is back home! We were asked to pass on this information from the National Forest Service about volunteer efforts to restore the trees in the forest. The graphics are a letter from Supervisor Jody Noiron (yeah, we know, settle down over there! ), and information on the Plant a Tree program, after the jump. Altadena Sheriff’s Station received information from Los Angeles Police Department personnel about a lone hiker stranded on a ledge in the Chaney Trail-Mount Lowe area of the Angeles National Forest. The hiker slipped off of a freshly-cut trail and fell 100 feet down the side of a cliff face, injuring his right leg during the descent. He landed in a dangerously precarious position and was unable to maneuver out of it. His cell phone only had intermittent coverage, but he was able to dial 911 and relayed his location to LAPD personnel. Los Angeles County Sheriff’s Department personnel from the Altadena and Montrose Search and Rescue Teams, the Special Enforcement Bureau/Emergency Services Detail, and Aero Bureau responded to the area and searched for the injured hiker. Approximately two hours later, the hiker used his cell phone to tell police he could see a Sheriff’s helicopter in the area above him. 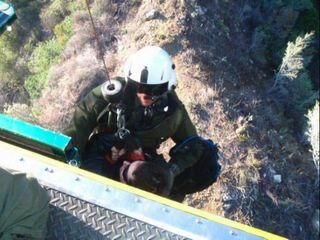 Personnel in the Air 8 helicopter located him on a rugged cliff area in Eaton Canyon; the Air Rescue 5 helicopter lowered a Sheriff’s Department paramedic to triage the hiker. 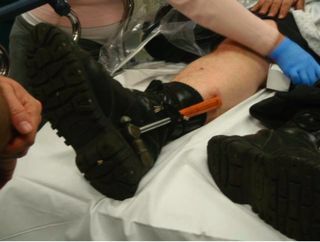 During triage, the paramedic discovered the hiker had fashioned an improvised splinting-device out of a hammer and boot laces, to secure his injured leg. The hiker was hoisted into the Air Rescue 5 helicopter, treated for his leg injury and abrasions, and airlifted to a local hospital for further treatment. Got lots of reports of emergency vehicles going up Chaney Trail, and have been listening to the scanner off and on this afternoon. Sheriffs mounted a rescue of a hiker, who was picked up sometime between 2 and 3 PM and helicoptered to Huntington Memorial Hospital with a leg injury. More as we get it. UPDATE 6 PM: PSN has something, but not much more than we do. 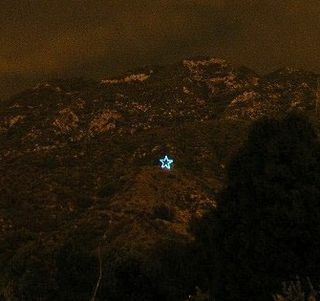 The hikers who went missing Dec. 23 above Eaton Canyon were found on the morning of Dec. 24, safe and sound, and remind us of the rules of thumb: carry water, carry food, let people know where you are going, and don't forget it gets dark early this time of year. 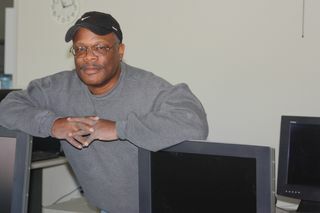 PSN's Janette Williams looks at the studio/home/inventor's bench of Altadena artist Todd Banks (and here's his website). HIkers (and later lawmen) venturing into the post-fire Angeles National Forest near Lucas Creek have found a couple of human skulls, one with a bullet hole and one with traumatic injuries. About 15 years ago, we were looking for a creche -- we never had one growing up, and felt that we needed one. Because we are also cheap, we finally found one in the after-Christmas sale at the Folk Tree Gallery in Pasadena for half off -- a simple set of painted terra cotta from Peru. We liked it very much, so we bought it, they boxed it, and we took it home. But as we unpacked the box, we found out that we had a passenger -- a broken, terra cotta cow, in a totally different style. It had a broken-off horn and a leg was just barely hanging on -- obviously from another set, broken and put in the box in the back room to be thrown away later, but instead they used the box to pack my set and didn't notice the cow already in it. This was my first nativity set, and I had a problem. What do you do with a broken, non-matching piece? Throw it away? Maybe -- but there's a protocol for getting rid of worn out American flags -- maybe there's some kind of protocol for broken creche pieces? I had no idea. I set up the nativity set, and put the broken cow in the back until I could figure out what to do with her. Well, for several years I just packed her and forgot about her until the next year. Sometimes she was put in the back of the display, where her non-matching brokenness wouldn't distract too much. Sometimes i just left her in the box as I brought out the other pieces ... but I never threw her away. Over time, tho', she has moved more to the front of the display, and now I like to put her nearest the Christ Child, despite the fact that she's broken and doesn't match the other pieces. She reminds me of ... well, me. That just means she needs to be there -- in fact, she's the one the whole event is for. 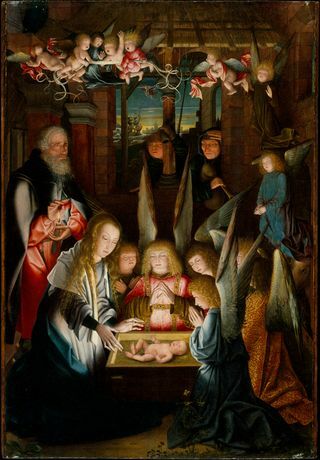 The picture is of a Flemish painting by an unknown artist, c. 1515, "Adoration of the Christ Child," which is in the Metropolitan Museum of Art in New York. Several years ago, psychiatrist Andrew Levitas and geneticist Cheryl Reid made a discovery: the angel closest to Mary, and possibly one of the shepherds in the back, bore facial evidence of Down Syndrome. They conjectured that the artist used models with Down Syndrome fully three centuries before the condition was identified by Dr. Langdon Down. And the artist didn't call attention to it -- in fact, they're representing beings (shepherds and angels) who are meant to be there. Imperfect and somewhat damaged, as we all are, but also welcomed to the Nativity. Thanks to that broken cow -- and that painting -- we take Christmas a lot more seriously now. Today at Steve's Bike Shop was the drawing for everyone who participated in last weekend's Altadena Arts Coalition North Lake Pole Shop Hop, and it was a nice addition to the Christmas season. 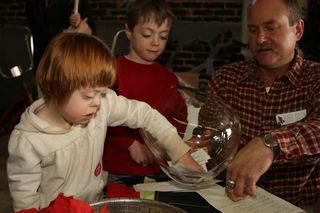 Top: Rosie Rutt (with brother Jake and Ben McGinty) draws the grand prize winner of a bike from Steve's Bike Shop. 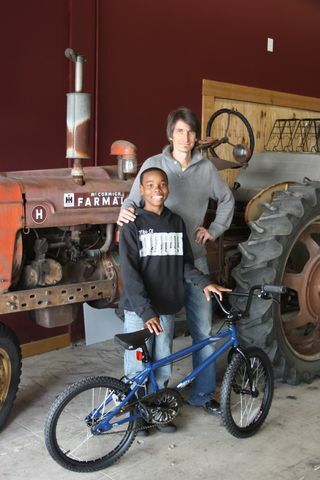 Bottom: lucky winner Caleb Snowden poses with Steve Salinas, who donated the bike to the drawing. Sarah Eagle of the American Cancer Society tells us that the first informational meeting for Altadena's second Relay for Life will be at Jan. 30, 2-4 PM at the Altadena Library, 600 E Mariposa St. The Relay itself will be at Loma Alta Park on May 15-16. Find out how you can join the fight against cancer. In this workshop, we will create Vision Boards. Visualization is one of the quickest ways to achieve your goals. It is a way to communicate with the universal power on what you want in your life. What better way to start 2010 with a clear vision of your life! Pasadena, CA (December 21, 2009) – The Armory Center for the Arts in Pasadena has partnered with Ovation TV and The Alliance for Young Artists & Writers to present the Los Angeles Scholastic Art Awards, the regional art competition of the Scholastic Art & Writing Awards. 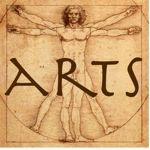 The Awards are the largest source of scholarship funds for creative teens in the U.S., offering recognition, exhibition, publication and scholarship opportunities for outstanding students in creative fields. 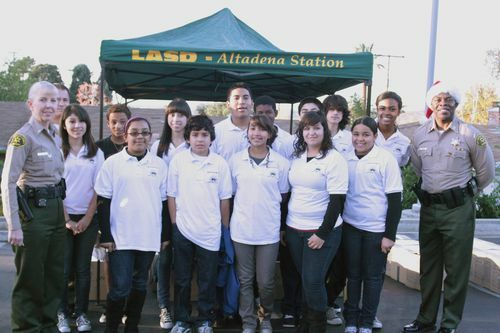 The Altadena Library's Heather Firchow and members of the library's Teen Advisory Council took some time to help out at the Foothill Unity Center's food and toy box giveaway in Arcadia this weekend, and she wrote about it in her blog! 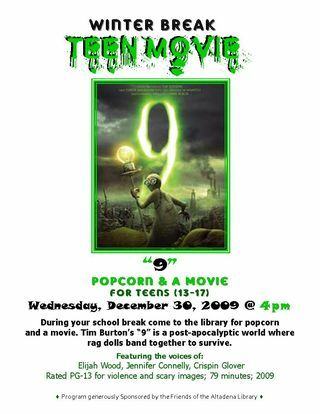 Winter break teen movie Dec. 30: "9"
On Wed., Dec. 30 @ 4:00 PM the Altadena Library District will present Tim Burton’s “9” as our Winter Break Teen Movie. During your winter break from school, come to the library for popcorn and a movie. Tim Burton’s “9” is a post-apocalyptic world where rag dolls band together to survive. Featuring the voices of: Elijah Wood, Jennifer Connelly, Crispin Glover. Rated PG-13 for violence and scary images. Do you enjoy hiking in the local mountains?? Then come and join us every second & fourth Wednesday evening of each month @ 7 PM, for a leisurely hike/walk up to Henninger Flats. We’ll walk up the Mt. Wilson Toll Road (5.7 miles round trip, with a 1,400’ gain & loss in elevation). We will start out @ 7:05PM so try not to be late. I have to lock the gate behind us. If you’re late the gate may very well be locked!!!! If there is enough interest, I will arrange to have the visitor’s center open for us. They have a little theatre up there and with enough notice, I can have them show one of their historic films on Mt. Echo & Mt. Lowe. On July 3rd, Saturday Night Special, we’ll be able to enjoy the Fireworks from the Altadena Town & Country Club as we are walking back down. Wear good hiking boots or walking shoes, bring water and if you like, something to snack on while we relax and enjoy the breathtaking view of the city lights at our feet. Meet at the gate to the Mt. Wilson Toll Road in Altadena on Pinecrest Ave. (Thomas Guide page 536, D-5). Altadenablog World Headquarters suffered a few flutters, but our power remained on -- not so for 1600 Edison customers in Altadena as of Thursday afternoon, PSN reports. Haven't heard word if everyone has been restored yet. PSN reports that 29-year-old Kameron Walker of Duarte, a member of an Altadena-based gang we will not dignify by giving their name here, was sentenced today for the murder of 17-year-old Dion Holloway. His accomplice, Eric Williams of Altadena, will be sentenced next month. Got the call approx. 6 PM -- wind blew a 60 ft. pine tree down at 2832 Maiden Lane, blocking the street, a vehicle underneath it. Sheriffs and county crews are working to remove it. They are in the Conference Room at The Coffee Gallery, and since the room is small, the classes are small. That way I can see what everyone is doing and provide individualized instruction instead of big mass paint-alongs. As close to private lessons as possible without the high price tag. I do have some openings, and hope that people might want to give classes as Christmas presents. I will provide an attractive gift card to present to the recipient, and they have gone over well in the past. If there are any questions, I can be reached at donna@barnesroberts.com or at 626-791-0851. My website is at www.altadenaartist.com or www.barnesroberts.com. The Crescenta Valley Weekly has a feature on CHP information officer Ming-Yan Hsu, who will not only be assigned to the La Crescenta office but to Altadena as well. A jury last week convicted two men with Altadena gang ties for the 2007 murder of 17-year-old Dion Holloway. Crime Scene blog has the deets. Star of wonder, star of night ..
We are actually trying to help organize our Wednesday singalongs, so everyone has lyrics in front of them, and any musicians know what key we will likely be singing in. A group of us who had nothing better to do Sunday night turned the Sunday night Singer-Songwriter showcase into more of a singalong, and thought that it would be helpful if we had a easy place to get lyrics. This is it! By using the same lyric links, we know that we will all have the same VERSION of the song. If you don't have a laptop, others will share so all can sing. Remember, this is not about the musicians or the person with the microphone. This is not about who sings the best or plays the best. This is about everyone having a fun time singing. Check out her Laptop Lyrics blog for the song versions and keys that're on tap so far for Wednesday night. Bring your voice, instrument, laptop (or any combo thereof) and sing along! McGinty’s Gallery at the End of the World is pleased to present Circa Sometime, an exhibition of selected works by six artists working in assemblage and collage. Circa Sometime marks the first such show at the gallery and includes collaborative and individual installation works. Described by Altadena Heritage as "the epicenter of the art scene in Altadena” - a magical gallery/garden that is itself a living assemblage of art and nature. Featuring artists Carl Heinz, Jeffrey Kibbe, David Lovejoy, Kathy Carvellas, Johnny Fox and Ben McGinty, Circa Sometime consists of over 70 works created with repurposed materials - objects and images not merely “found” but specifically selected to become part of a greater whole. This exhibition is a collaboration of art and artists, creating unique environments to showcase their works together. The Winter Solstice occurs on Mon. Dec. 21 at 9:47 a.m. At that moment the Sun, in its apparent path around the Earth, reaches its farthest point in the South. This marks the beginning of Winter in the Northern Hemisphere and the beginning of Summer in the Southern Hemisphere. Winter will end with the Vernal Equinox on March 20, 2010. It's been awhile since our neopagan days, but we recall that this is one holiday that doesn't seem to involve running around naked. Stay inside with milk chocolate, cookies, and a warm blanket instead! toward Braeburn. I made a U-turn and followed them. Unfortunately, they knew that I figured out what was happening…and began driving erratically, speeding, and running stop signs. I trailed them for a few blocks but couldn’t keep up. I never got close enough to get a license plate, though that was my intent in following them. 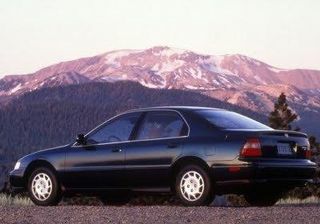 The car was a black ’94-95 range Honda accord / not completely sure whether it was a 2-dr or 4-dr but I would guess that it was a 4-door. I have attached a similar image to the car I saw. Most often these types of crimes are committed by people who live in the general area, it wouldn’t be uncommon for them to revisit out neighborhood to case for another burglary. Please keep an eye out for this vehicle. I called the Sheriff’s Station and they responded quickly. I gave them the above information and a report was taken. The victim resident was not at the house so I’m not sure what items were taken nor did I stay around long enough to find out how they made entry into this house. The house doesn’t appear to have anyone living there on a regular basis, but it’s not vacant. It did not appear to have an alarm. If it did, it wasn’t set / functional. ... for those of us on the east side of town, around 6:20 -- the whirlybird was in pursuit of a burglary suspect, says the sheriff's station. Per scanner, it had to break off to handle a gun-related incident elsewhere (no details on that), but sheriff units are still in the neighborhoods as of 6:40. A reader also wanted to know what the cops were doing at Mendocino and Porter around 5 PM -- per scanner, apparently found a vehicle that may have been fingered in a recent burglary. UPDATE 4:30 PM: Called the sheriff's station to see how the incident resolved itself, seeing as there were several cars and police dogs deployed around Boulder Rd. and Page Dr. Deputy said that they caught the suspect, who had apparently grown tired of waiting afer a house-to-house search, and the scene wrapped up around 1:30 PM -- so congrats to the sheriff's department for this one. The Altadena Arts Coalition, the merchants of North Lake Ave., and Christmas Tree Lane put together a fine Shop-Hop experience during an unseasonably mild December day (contra last weekend!) It was a good day to shop, visit, and add to your Christmas Tree Lane memorabilia (yes, that is our banner in Galloway Alley). Today's the day the Altadena Sheriff's Station and members of the community distribute the fruits of their holiday food and toy drive. 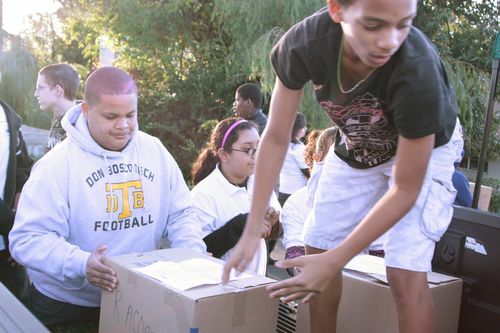 223 needy families will receive toys, some staple foods, and a turkey to lighten up their holiday season. This morning, the Community Center parking lot was a beehive of activity as the sorting and distribution process began. Volunteers sort bags of donated toys for eligible families. ... and sorted them out in the parking lot. ... and young men involved in Mentoring & Partnership for Youth Development (MPYD), who really need to smile! Loma Alta Park will be hosting the Big Red One himself this afternoon, 5-7 PM at 3330 N. Lincoln Ave. There will be refreshments, a raffle and prizes, special celebrity guests, and Santa will give toys to children 12 and under. The event is co-sponsored by the California Highway Patrol (Altadena branch), the US Marine Corps, Operation Feed the Streets, Lymelite Media, The Hundred, The Ivy League, and Pedarol Records. Neighbors Empowering Youth, Inc. is celebrating the opening of its new computer technology training center today with an open house that starts at 5 PM. The center is located at 2662 N. Fair Oaks Ave.
NEY is a nonprofit 501(c)(3) service organization that provides computers and computer training to the underserved youth of Altadena and northwest Pasadena. NEY's president and founder John Smith said that they moved the center from its previous Lincoln Village location because they needed the room to match their ambitions. "Most people we work with are low-income families, without computer access," Smith said. Among the programs NEY offers are providing free computers to students and their families who might otherwise not get them, along with twelves hours of training in Word, Excel, and internet safety. NEY has to date trained over 150 adults and have awarded over 100 computers to students of area schools. NEY also has an outreach program, where they conduct training for both youth and adults, and a computer workshops that allow young adults to participate in hands-on learning in an environment that places emphasis on computer-related skills and technologies. They have set up computer labs at Little Citizens Daycare Center, Pasadena Recovery Center, and Morning Star Baptist Church. Winston Lieu of the Los Angeles County Dept. of Health tries to entice people to get the H1N1 vaccine at Farnsworth Park today. 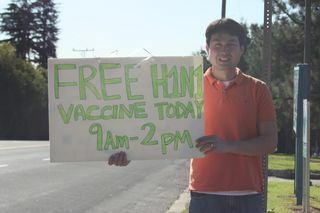 The county was offering free shots today (we got one), and business was really slow. Shots will be available until 2 PM today, so hurry over! We're trying to pin this one down:possibly the worst written press release we've ever seen ("Altadena Department of Parks and Recreations"? "Altadena Highway Patrol?" There are no such). We haven't gotten official notice of the event (altho' county -- yes, COUNTY -- parks and rec is notoriously spotty in giving us information). We'll try to pin it down tomorrow. The LA County Sheriffs are looking for service minded volunteers to apply for their "Volunteers on Patrol Program". It is a short training period. You will get driving courses in a squad car and learn radio codes and much more. The program needs you about 20 hours a month. If anyone out in the community is interested contact Sgt Bartlett and he can assist you (626-798-1131), or you can go online and fill out an application. You knew that the Altadena Arts Coalition was planning to salvage last week's rained out Shop Hop, didn't you? FIRST, the businesses involved are extending the qualification time for the Grand Raffle until December 24. During this time, visit the listed merchants, businesses, & restaurants to get a star affixed to your Shop Hop card to qualify for the Grand Raffle (no purchase or obligation required). Many prizes have been generously donated by local business owners, with the grand prize being a new bicycle from Steve's Bike Shop. 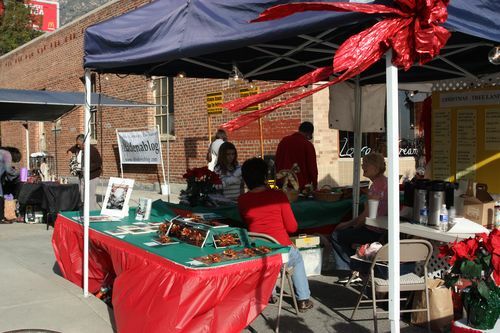 and LAST (but not least), the Christmas Tree Lane Arts & Crafts Festival, also rained out last weekend, will be open for business in front of the Webster's stores. All good reasons to come down Saturday afternoon! Due to the crazy rain last Saturday, we'll be opening the gallery up for "A Second Look" at Erik Estrada's amazing photography...and our sorta cool iPhone photos. As an extra holiday bonus, all prints will be half off the listed price. ". The Friends of the Altadena Library present a free workshop entitled "Igniting Your Writing-How to Begin" by best-selling author, Dorothy Randall Gray. Gray, a nationally acclaimed writing workshop leader and motivational speaker, has captivated television, radio and university audiences throughout the U. S. and abroad. Both new and seasoned writers will gain much from her inspired teachings in this stimulating participatory workshop. Learn how to capture the experiences of your life and effectively commit them to paper. Get the tools you need to get started and keep on going. Igniting Your Writing: How to Begin will show you how to use inspiring thoughts to turn simple ideas into sensational stories, memoir, poems and more. It will help you discover infinite sources of creativity and transform ordinary experiences into extraordinary writing. You will learn how to identify the power points in your work and finish what you start. This workshop utilizes evocative exercises, storytelling, music, stimulating feedback, handouts and professional perspectives to inform, enlighten and inspire. United States and abroad. 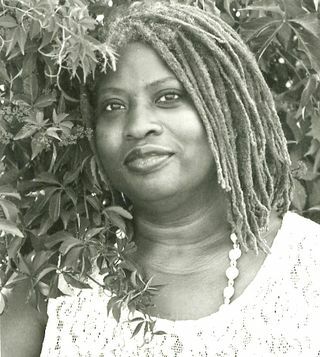 Her writings have been featured on television, radio and theater, at cultural, health and educational institutions. 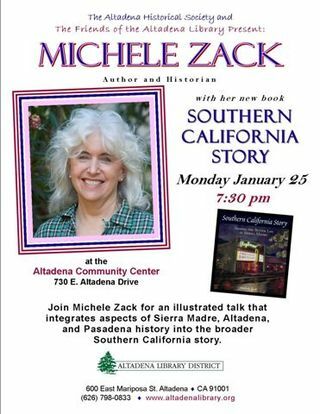 Michele Zack, historian and award winning author of Altadena: Between Wilderness and City, will give a talk illustrated with historic images from her new book, Southern California Story at 7:30 pm on Monday, Jan. 25 at the Altadena Community Center. Her new work integrates aspects of Sierra Madre into regional and national history, and the topic of Monday's program will be the interesting connections and contrasts among Sierra Madre, Altadena, & Pasadena. This program is jointly sponsored by the Altadena Historical Society and the Friends of the Altadena Library. Bio: Zack, in addition to her writing career, has served three terms on the Altadena Town Council, spearheaded the Watershed Committee, and devoted much time to Altadena Heritage and the Altadena Foothills Conservancy. Currently she works with the Huntington-USC Institute on California and the West on a federal Teaching American History Grant with public school teachers, integrating state history into national history. In the1990s she lived in Thailand and California as AsiaWeek's correspondent, and was a regular contributor to Far Eastern Economic Review. She is also the author of a popular ethnography of a wandering hill tribe in Southeast Asia, co-author of Fielding's Guide to Thailand, and has written widely on business and culture in Southeast Asia. Free H1N1 flu shots will be administered at Farnsworth Park by the county Dept. of Public Health, 9 AM-2PM. The Altadena Library's Fun Flick Friday: G-Force, starts at 3:30 PM in the Community Room, 600 E. Mariposa. Super Saturday Family Storytime at the Library, 10-11 AM. The Altadena Arts Coalition, the merchants of North Lake Ave., and the Christmas Tree Lane Arts & Crafts Boutique present the North Lake Pole Shop Hop Festival (take 2) from 10 AM-4 PM in the North Lake Ave. business district. 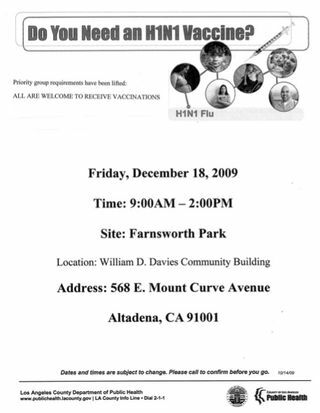 Free H1N1 flu shots at Farnsworth Park Fri.
Y'all come now: free shots for H1N1 (swine flu) will be given out at Farnsworth Park Fri., Dec. 18, from 9 AM to 2 PM, by the Los Angeles County Dept. of Public Health. Another burglary, this morning about 11 AM, a home on Loma Alta. A witness described a black Chevy Tahoe with factory tints, paper plates saying Pasadena Chevy Dealer, driven by a female Hispanic, backing out of the driveway of the home. There was also some activity on Lake and Altadena Drive around 3 PM this afternoon, as sheriffs stopped a black Tahoe that matched the description. A deputy told us that it turned out not to be the suspect. And close to our own neighborhood, a home was burglarized on the 2500 block of Holliston Tuesday night, but we could get no details. Pictured: a black Tahoe, from the official Chevy site. First in our crime rundown for tonight: two hikers were robbed at gunpoint at the vehicle turnout on Aladena Drive above Roosevelt this morning about 2 PM. We were in the neighborhood at the time and heard it on the scanner -- sheriff's deputies were at the turnout, Pasadena PD was monitoring the entrance to the park on Altadena Dr., and the helicopter was overhead, but the robbers -- a white man and a Latino -- disappeared into the woods. Brian Day at PSN has a succinct story. We're planning some massive updates for late tonight -- a LOT of criminal activity in the past couple of days, plus just got news of collision w/ambulances responding at Woodbury and Fair Oaks (5:15 PM). The council started at 7:30 tonight, after having a closed executive meeting following the resignation of Herbert Simmons. Chairman Gino Sund gave a brief report that they had investigated Simmons following numerous complaints, and kept the investigation confidential to protect Simmons and the council as a whole. The investigation diverted resources from their central mission, which is service to the community, and now is time to move forward. The matter is closed, no further information will be made public, and no further comment will be made. Because of the resignation, there is an empty seat for census tract 4602, and the council is accepting applications. Any resident of tract 4602 who is a citizen and 18 year of age or older is eligible to fill the vacancy. Sheriff Capt. Roosevelt Blow said that the station had collected two rooms of toys and food from the food drive, and that distribution to over 220 families will start Sat. They still need volunteers, and kids 12 or older who need community service hours are welcome -- call Lt. Shiela Sanchez at the station, 798-1131. The station is also looking for volunteers, including those with administrative skills. For more information, call Community Relations Sgt. Dan Bartlett. Ben McGinty of the Gallery at the End of the World announced that the Altadena Chamber of Commerce Citizens of the Year are C. Jake and “Mr. T” Truman. Embattled Altadena Town Councilman Herbert Simmons resigned today, hours before the closed meeting that was to determine if he would be removed from his council seat. I will no longer be part of an organization that does not operate as a legitimate government and that is not open, transparent, and accountable to the community. Effective December 15, 2009, at 12:00 noon, I resign my position as Council Member of Census Tract 4602. Rest assured that I will remain more active than ever in keeping our Altadena community informed, and I will continue full throttle in encouraging and spotlighting the wonderful progress being made in our local public schools. 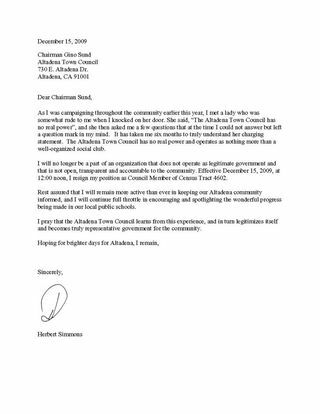 I pray that the Altadena Town Council learns from this experience, and in turn legitimizes itself and becomes truly representative government for the community. Pasadena Star News has a story already here.